Like so many of the people that have read this book, I absolutely loved it. Even though I'm not a huge mythology nerd, I found myself immersed in this world and completely in love with the story. I knew enough about Greek mythology to recognize most of the characters and know the important characters' stories, but even without that knowledge I feel like I still would have enjoyed it. I knew going into this book, that it is primarily a love story. There is war and other elements, but don't be fooled. If you go into this book thinking that it's a fast paced war story, you will be disappointed. The writing is beautiful and poetic, but the pace is extremely slow. It begins with Patroclus as a young boy. Years go by before the start of the Trojan war and I believe they are around 27 when the book ends. I never read much about Achilles, or if I did I don't remember it, but I love how he was portrayed with all of his qualities, not just as how Patroclus would like to see him. He's proud, egotistical, and lethal, but his softer side comes out when he's with Patroclus and he's shown as gentle and loving. There's more to him than his reputation on the battlefield and I think this book will forever change the way I see him. No book is without its faults and I can definitely see why some people may not enjoy this book. Patroclus is the narrator, but he spends most of his time describing Achilles and thinking about how great he is once they become friends. It seems like Achilles is everything to Patroclus and for most of the book he is, but by the end he grows to become someone that loves Achilles, but he no longer hero worships him, like he once did. It's not a surprise that Patroclus and Achilles will die. Near the beginning of the book, Thetis outright tells Patroclus that he's going to die. 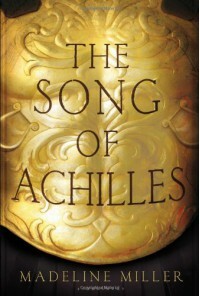 Later Achilles learns that he will also die, but only after he has killed Hector. This begins a sort of joke between them because Achilles likes to say that Hector has done nothing to him, so he has no reason to kill him. The foreshadowing was very obvious to me (possibly because I knew most of the story anyway), but that didn't take away from the ending at all. It almost made it even more sad because the reader could see all the pieces fall into place for the tragic ending. The way all the characters were written felt true to their stories, especially Odysseus. If Madeline Miller ever writes a book about Odysseus, I won't hesitate to read it.